If this year’s Superbowl proved anything – besides how dumb it is to spend up to $4 million on a 30-second TV spot – ii’s that brands need to move at warp speed to stay in the game. And how effectively they do that is no longer measured by how much money they spend. In the midst of the spending frenzy, the standout brand was the humble Oreo cookie, and not because of its lame Superbowl ad. As The Cluetrain Manifesto so presciently noted in 1999, there’s no longer a market for heavy-handed, expensively choreographed 30-second messages. But it’s taken until now for the reality to begin to sink in for brands. It was re-tweeted 10,000 times in the first hour, and thousands of times since then. Actually, there’s no such thing as free creative or free marketing. 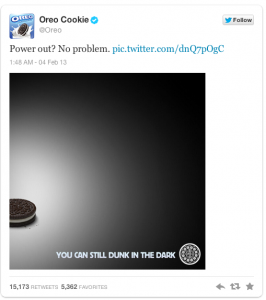 The Oreo Tweet was the result of smart planning by Oreo’s digital agency, 360i, a client who trusted its agency’s judgment and didn’t stand in its way, and the lightening speed of online conversation, which spread the Tweet. According to 360i’s blog, members of the agency team and the client gathered at the agency’s Tribeca headquarters, in a social media “mission control room” to monitor the brand on a variety of platforms measuring conversations and interactions across all social media channels. Oreo also scored big with its sculptures made of Oreo cookies or crème, modeled in real-time from Instagram photos tagged #cookiethis or #cremethis by photographers. 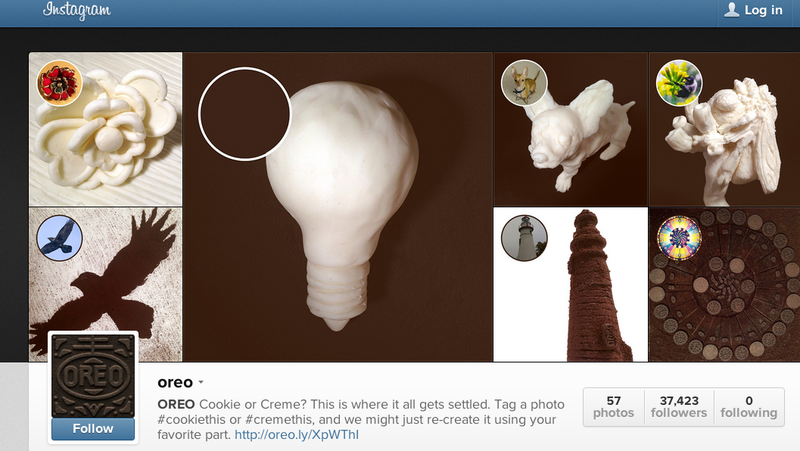 The foundation for that kind of responsive marketing has been the hallmark of the agency’s work for Oreo. Oreo and 360i embody a trend that spells huge challenges for brands, who are expected to provide real-time response, especially to questions and problems. 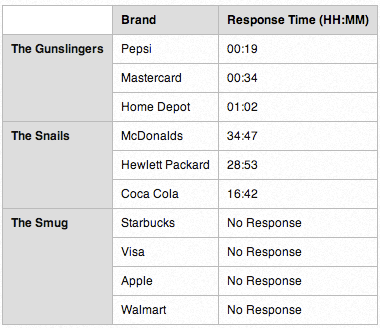 In fact, top brands now respond to customers in a matter of moments, and risk losing customers when they don’t. Who’d ever have believed, a few years back, that a 20-minute response time by a brand would fall into the “snail” category. But that’s today’s reality, whether brands like it or not. Here’s a bet I’m willing to make: the lights have gone out on multi-million dollar, one-shot Superbowl ads. And not a moment too soon if you ask me. Because the time and the tools for real-time media are in place, and have been for a long time. Now all we need is for brands to have the nerve to really – at last – join the conversation.